Now I’m in trouble, a mare’s nest by any standards! However I think that there is no getting away from the need for an artist to address at the very least their personal feelings/thoughts on the subject. I don’t feel the need or even see the possibility however of coming to any concrete conclusions. I am trying approach the issue by simplifying it as much as possible and trying to find comparisons or disparities with other human activities. A few days ago when digging through my backlog of work I came across a painting that I did maybe 20 years ago. Nobody has ever seen it but me. If nobody ever sees it then can it be included in the set of objects to which we apply the label “Art”? It has some small input via the experience of producing it that must have in some small way influenced later efforts that have been seen, but this is of an homeopathic degree. So I have to conclude “Art” presupposes a viewer, a consumer. An artist can never properly “see” their own work which is one of the most trying difficulties of the trade, but more on that another time. So what happens if someone sees my up until now unseen painting? The object itself hasn’t changed. I am possibly unchanged as well (I might indeed be dead at that point!). The only change is in the experience of the person who has viewed it. Therefore you might argue that it is there that the “Art” ingredient must be sought. Art indeed must be in the category of things that change people via their perceptions. A pretty wide set of things you might think. A closer look though shows that may not be so. We can exclude all things not created or arranged by a conscious act of another. So a magnificent vista might be inspiring but if there has been no intent to cause such inspiration then we would have to exclude it. A magnificent vista set out by Capability Brown and nurtured by generations of gardeners might fall on the other side of the balance therefore. This simple delineation however can be questioned. If the viewer of the park set out by Mr Brown knew nothing of the business of landscape gardening then their experience would surely be indistinguishable from the appreciation of a natural and accidental vista. The unavoidable conclusion is that the thing that is the manifestation of “Art” requires a certain degree of pre-knowledge and training in the act of appreciation in the viewer to be present. Good art from the viewer’s perspective might be a work that increased, reinforced, corrected or honed the current state of their pre-existing fund of knowledge. I once read that tribal peoples when first contacted did not immediately recognise photographs as representations. Also young children do not recognise their own image in a mirror until a certain stage of development. The development of aesthetic appreciation might be considered as the making of ever nicer (finer) distinctions between similar things. What are we to make of this if we are claiming to be in in the business of making objects imbued with the “Art” virtue? It would seem doing it purely for self gratification is not enough, however pleasant. I might therefore need to have a consumer of my efforts in mind, in whose perception the “Art” will be manifested. Though I may well at the moment of creation have little choice but to rely on my own self knowledge and accrued experience of other’s reactions to my own and other’s work to guide my efforts effectively. It makes it very valid to consider, “Who am I painting this picture, making this object for?” or “What practical use to another might this image be?”. If I am aiming to please a lover of cuddly animals it might be wise to include kittens, but if I am to be on target for admirers of landscape painting then I might be best to leave out the kitties. I could if very cunning make my kittens appeal to both cat lovers and modern art fans the later group taking the aforementioned felines as kitsch and ironic. 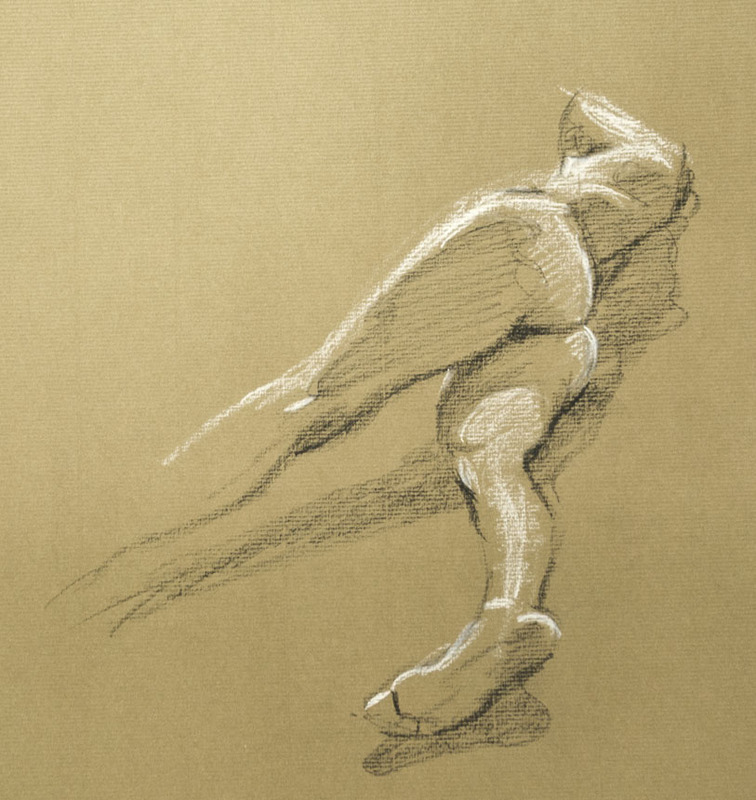 If art is this thing that we need to come to fruition within the minds of others then getting your efforts in places where they will be seen by your target group is an integral part of the whole process. We can’t all be as desultory in self promotion or as lucky as Van Gogh who’s brother was an art dealer. So where is the transcendental element, the poetry, the intuition? As artists we all, I would guess, hope to imbue our work with this evanescent quality. Or rather should I say cause it to manifest in the consciousness or subconsciousness of the person experiencing our work. The answer alas is different for different groups of viewers in different times. We only have to look at whole schools of work that have been pitched into the historical dustbin by a change in fashion. The works are still the same, it is only the minds which experience them that have altered. There is a warning here for artists working in comfortably fashionable niches, the estimation of your efforts will inevitably decline with the mortality of your fan base or dissolve with ephemeral fashion! So how does all this relate to me or you as a practicing artists? I myself wilfully paint subject matter nobody cares much about in a style that is well past its sell by date, so any thoughts of fame historical or otherwise are plainly not on the cards. Many artists I know or read opinions of who paint in a similar manner to myself tend to rail against the sidelining by “Modern Art” of skilled representation. But I think there are more and just as good painters in this manner now as in in any age, so in sheer numbers and quality the form is thriving. In our current times almost every so called past historical style has its proponents and exponents. Maybe it is time for art historians and other official cataloguers of creativity to just accept that the tidy linear progression and pigeon holing of art is no longer valid (if it ever was). The variety of uses, degree of availability, worldwide audiences and different mediums make it hard if not impossible to assess and rate the vast quantity of offerings available. It is better maybe to consider all the many different branches of human creativeness as squares in a quilt. If we wish to grade them then we might say each square of material should be sized in proportion to the number of exponents and proponents, but the highs and lows of individual achievement can only be assessed within each square or group of related squares. Overall the lesson to be learnt is don’t hold back on the self promotion, it is an integral part of painting just as much as brushes and paper. Now we approach a related area where I think there is just cause for indignation. We live in a society where the state subsidises or otherwise provides support for what we call Art. In view of just how much the creative landscape has changed in the last hundred years it seems perverse to have an “Official” arbiter of worth in creative arenas that has such a narrow definitions of worthiness. I see no particular reason why a conceptual artist should be considered for say the Turner prize and a “traditional” landscape watercolourist not, the organisers may cry that what they are picking is the newest and most cutting edge but the actual choices belie that with most of the offerings relying on ideas that were old in the 1950’s. So purloining a style and raison d’être from 1910 is OK but one from 1850 is not. Landscape watercolours which have a fine tradition in this country having consistently had wonderfully talented exponents in the UK for centuries, but the Tate seems to think they stopped painting them in 1900, the V&A in about 1950. What criteria have been used that lead to cease considering these works as possibly noteworthy? Is a good painting considered worthwhile for it’s quality relative to other similar works or it’s date of creation and its supposed historical context? You could I think assemble just as fine an exhibition of landscape watercolours from 1980 as 1850 but for some reason an average watercolour from 1850 seems to be more worthy than a brilliant one from 1980. I suspect the curators from these institutions never even look at the output of contemporary landscape watercolourists unless they have some fine art pretensions. There would be no complaint if these were private institutions but they are state funded by a democratic government. In my book of definitions anything painted today in whatever style historical or experimental is modern and contemporary and needs to be judged within its own tradition without prejudice or misplaced art historical or aesthetic snobbery. I’m sorry about my focus on painting but the same arguments could easily be broadened to cover any medium. Well if anybody managed to get through that you deserve a gold star! To lighten the mood here are a few new ones. A simple view near a friend’s cottage, browns creeping into the spring foliage as it has been so dry. Keston fishponds near Bromley the end of the day, the light made everything look beautiful concentrating the colours. 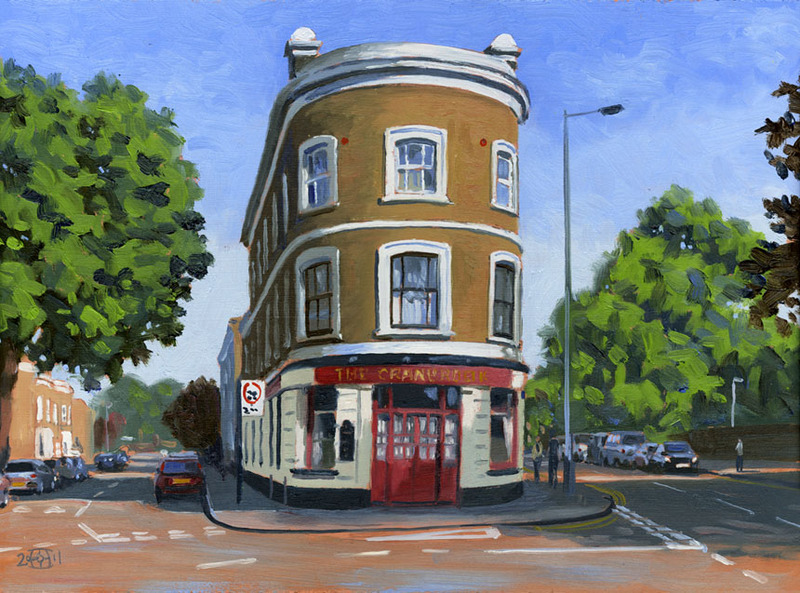 The pub next door to my house, It took me a couple of early mornings to get it done as the light was so transient. The publican has recently painted the front black which looks horrible so I reverted it to it’s old livery later in the studio! 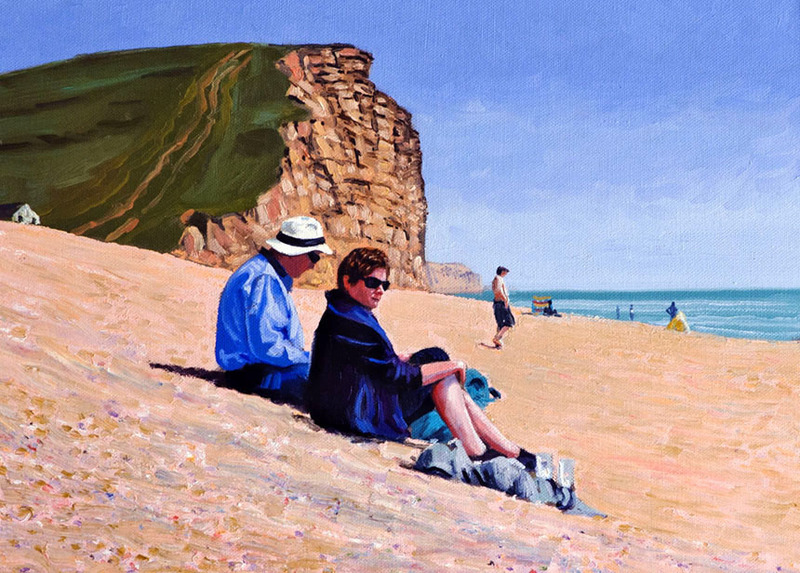 The first of a few studio paintings from my recent travels, this is the beach at Bridport with my friends Richard and Kate looking French and Hollywood glamour respectively. Richard had a distinctly Seurat feel with his pose and hat! 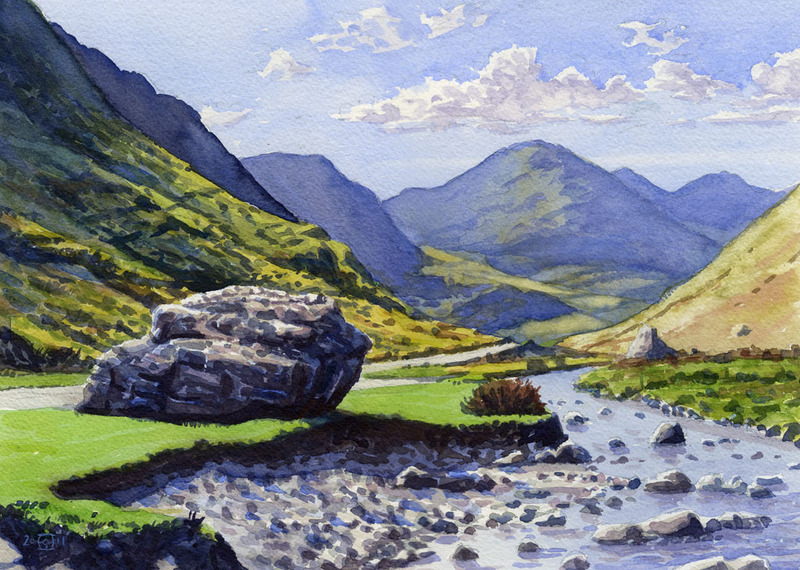 A studio painting from my recent expedition to Cumbria. This is the Honister Pass. This line of beech trees took my eye when I passed through the Cotswolds. I am using 300grm Arches paper which I like better than the Saunders I have been previously using. I have found the Saunders to have occasionally variable sizing that has caused several recent efforts to end up in the bin. Spring Greens and Life Drawings. Managed to misplace my Blog password so a bigger gap in posts than I would like. I have been painting the spring which has been like no other I recall. 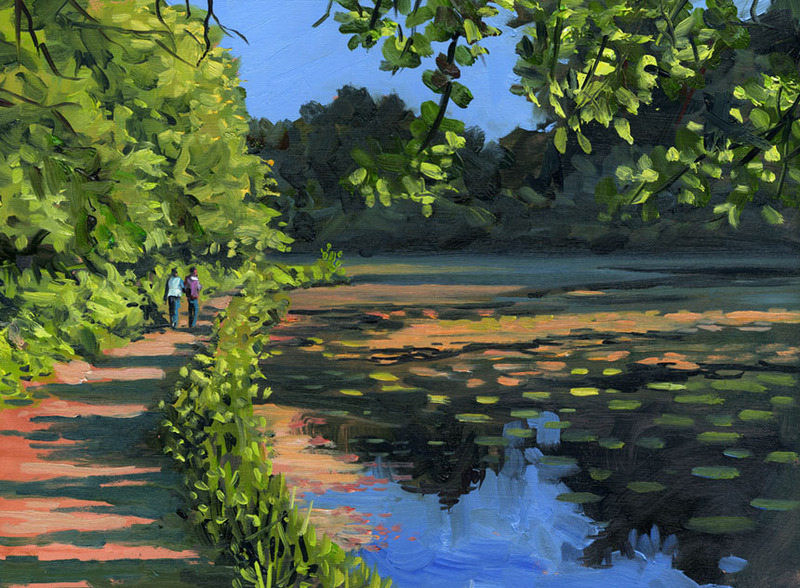 Now I am painting regularly every few days I am noticing the changes in the seasons day to day far more than I have in recent years. Another unexpected bonus to the painting lark. My studio work alas is at a standstill. I know I must make a next step but am not sure just what the direction ought to be. The world has enough pretty views and enough gritty urban ones for that matter, indeed adding another work to any genre seem a pretty vain act. I know this is foolish of course, but nonetheless I have always needed to feel there is a new discovery to be made in each work, which is easy in a plein air but harder somehow in a studio work. It is no real use to do a painting that is merely an exhibition of skill, any more than a piece of cabinet making that is just about the joints used and serves no use would be. It must have beautiful craft and also be beautiful in purpose such as a chair. With chairs the purpose is straight forward, but with a painting less so. I might do for example a painting to please another, to adorn their walls. I know several very fine painters who do just that, they paint when there is a commission to do so but not otherwise. 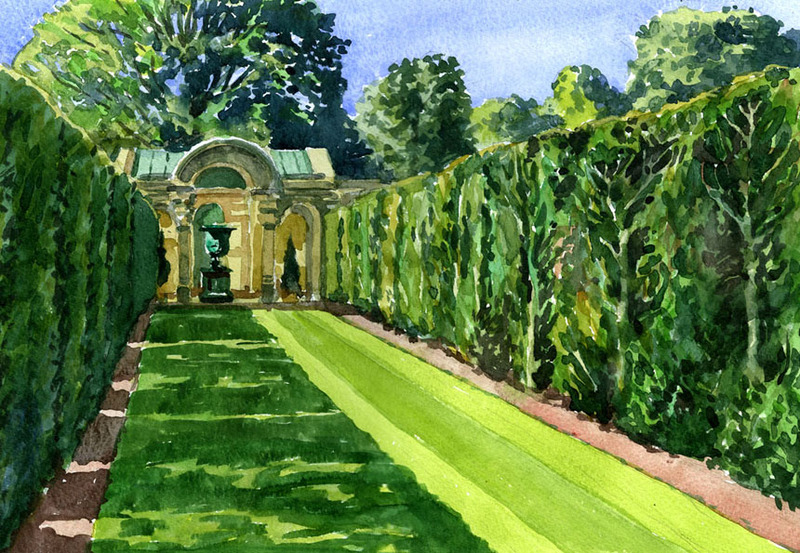 For me I have always painted “for myself” as well as commercial work, which when I was working a great deal was almost as a sort of relaxation I could hardly wait for the gaps in my schedule. Now I have mostly eschewed commercial work it is not so easy to create as somehow a reason is needed The answer I feel is that the value has to be in finding myself enriched by the experience of doing a painting. So I have to take on some subjects that are more demanding, not complicated but I think more nuanced… we shall see! For now here are a few plein air watercolours and a slew of life drawings. I have built a nifty watercolour slash oil painting attachment for my tripod to allow me to paint standing or sitting in either medium and as many different formats as possible… which will be the subject of a very nerdy post all by itself. 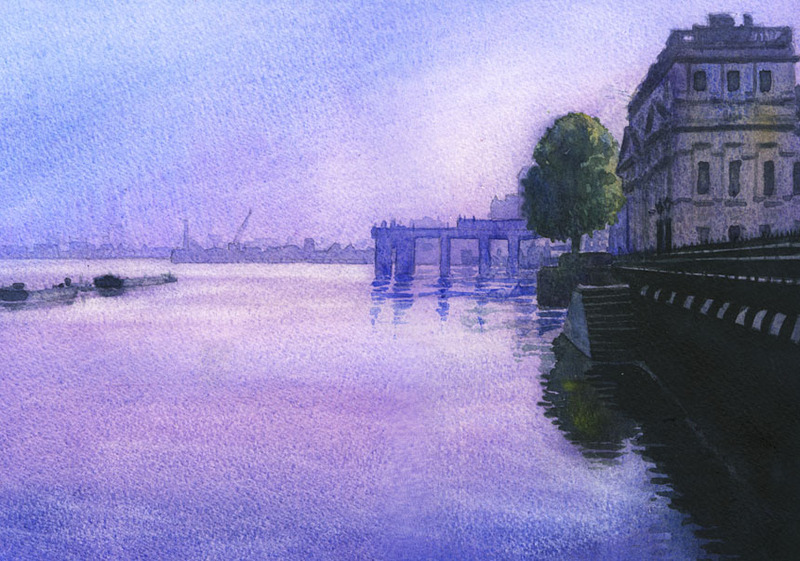 Watercolours can be clicked for larger version. 14in by 10 in. I have decided to paint a little larger in my outdoor watercolours so it was a deep breath and out with the bigger brushes. I used a 1/2in flat a fair bit in this one which is fine as long as you don’t get square edges in places you would prefer not. This was a gorgeous spot on the River Avon in Hampshire. The spring is so advanced with everything extremely verdant. Usually I steer clear of brilliant greens but I could really see no alternative. I have tried to add a little red to every sunny green and a little ultramarine to all the shadowed hues. The result is still quieter in hue than reality but not I hope too eye wrenching as painted greens can often be. 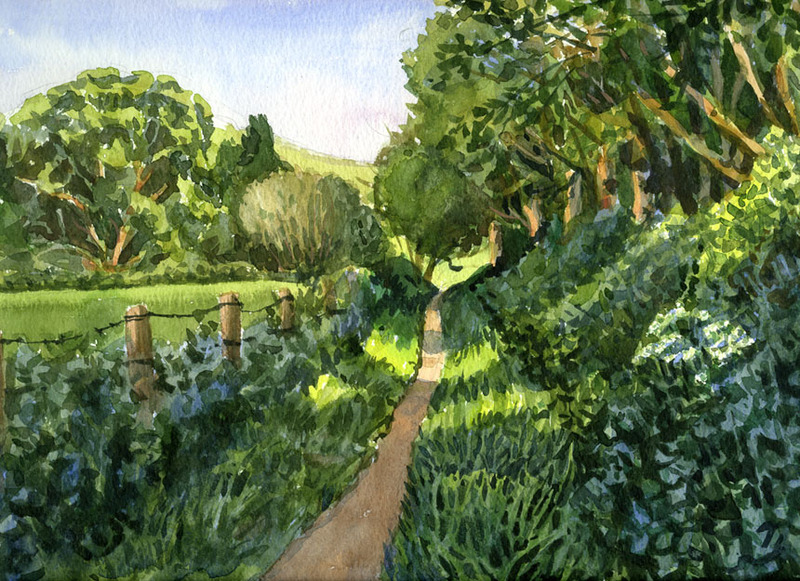 This path is in Child Okeford Dorset. Back home and the day was so beautiful I set off to Kent. It was very windy so I did this which was sheltered under a gazebo. The light was very crisp and clear and the textures of the old and worn hedges fascinating to to try and catch. Again my brush wandered into greens I don’t often touch. 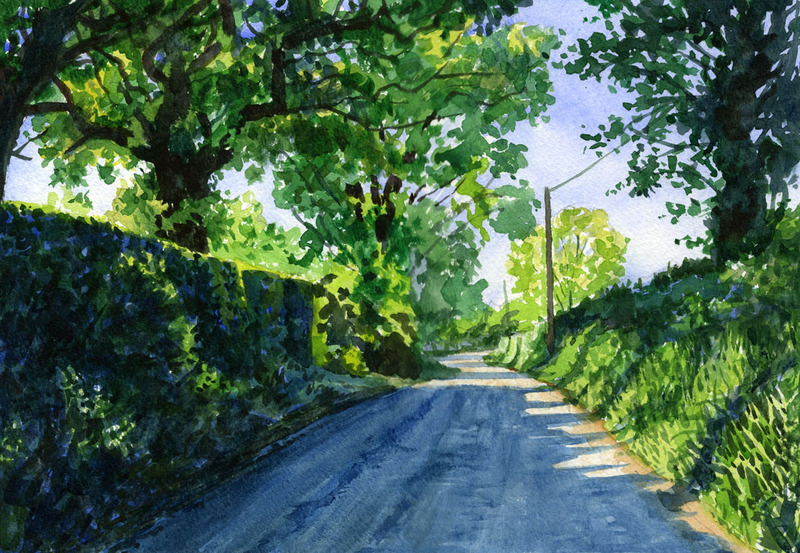 A quiet road near Westerham Kent. 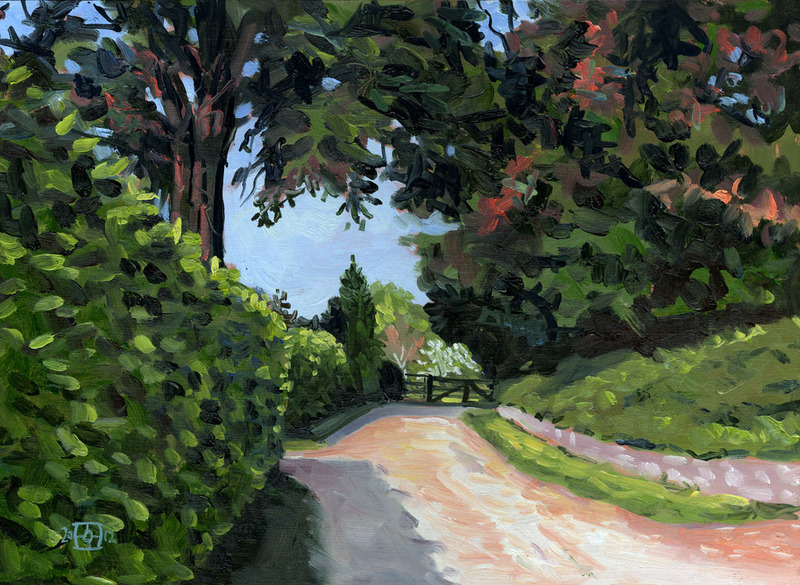 This composition appeared many times along the way but not anywhere where I could paint it without being run over! Eventually I stopped on a wider bit so I could paint protected by my car! 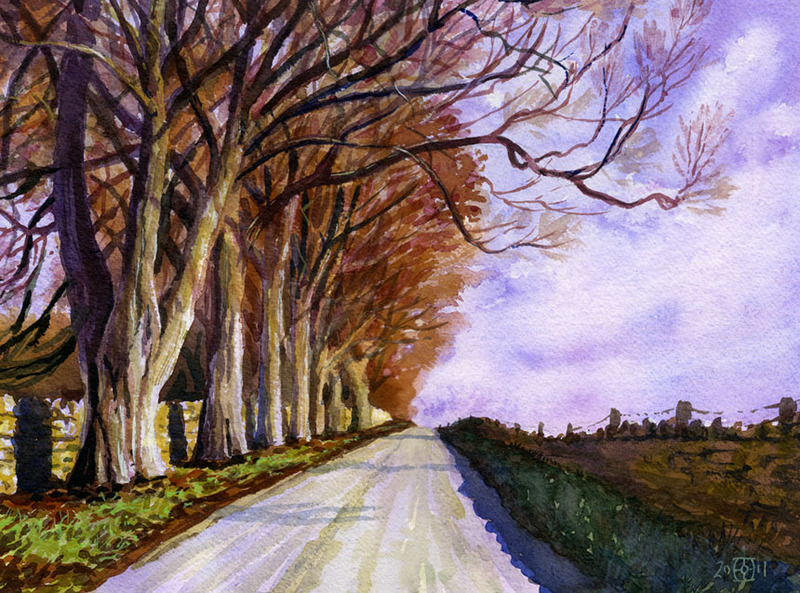 The light through the trees was fantastic and I underlaid all the shadow areas with a wash of ultramarine moving to prussian blue for the road. 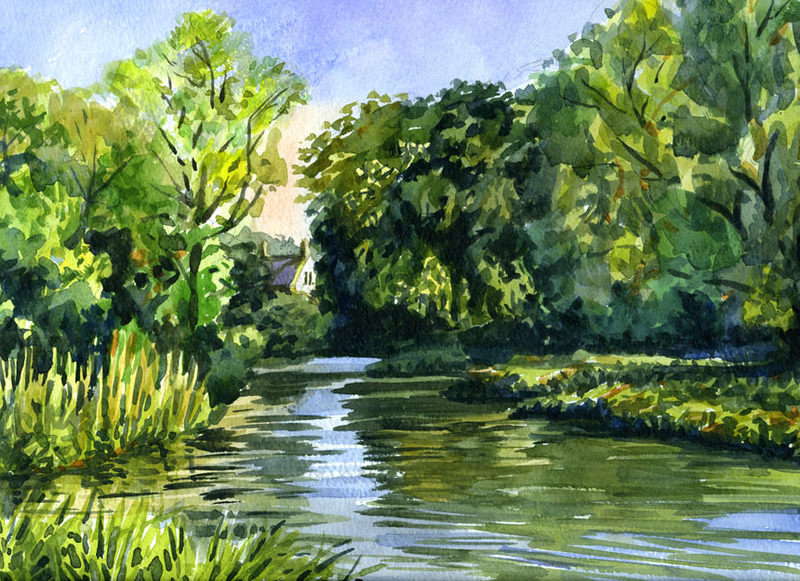 A sad story here, I got up at dawn to paint the river and did this in beautiful morning light. But a few days later when doing another in the studio I knocked my water over and swamped this one as it lay on the table. At least I scanned it before its demise. 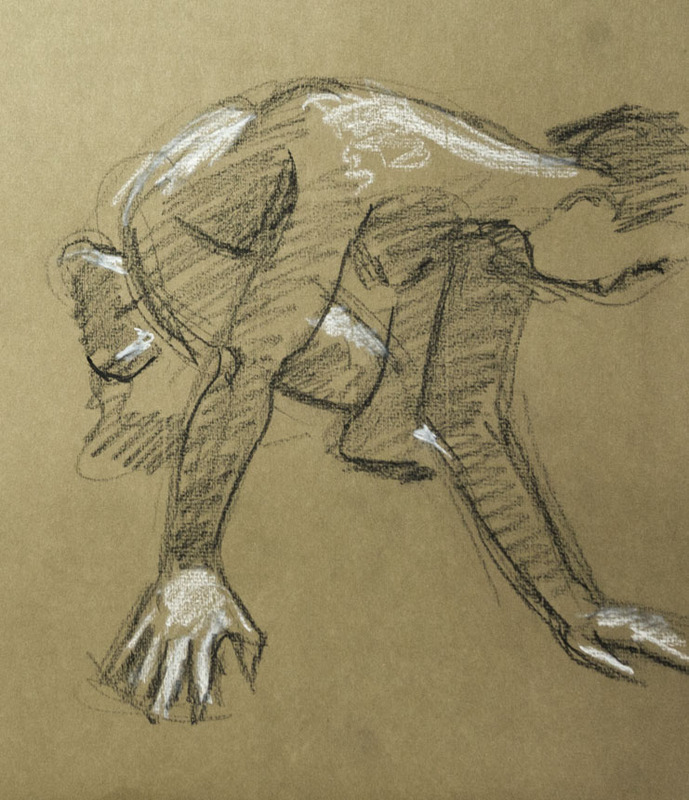 Lastly a few life drawings to finish off. 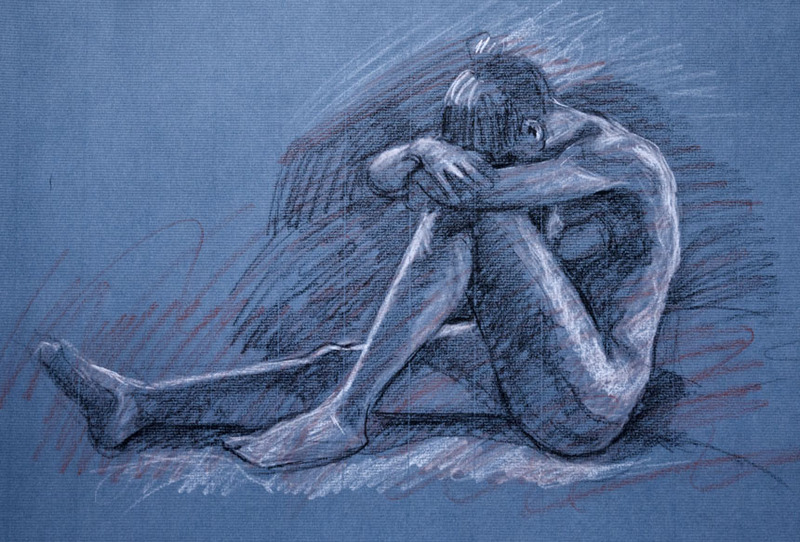 I am enjoying life drawing at present. I have reduced the colours used to just black red and white, the traditional trois crayons though I need to use the red more.